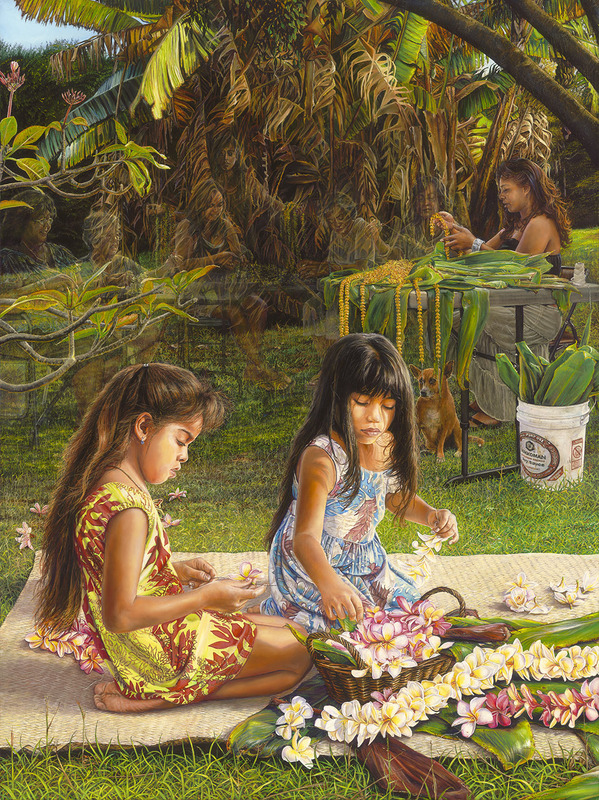 In the deep shadows of the peaceful garden beyond where the children sit making plumeria lei, I think I can see the outlines of lei makers that long ago sat in the very same place. They are seated at their tables, patiently stringing the fragrant blooms into beautiful creations. I close my eyes and drink in the fragrance of ginger and plumeria when, in the rustle of the leaves overhead and the sweet trilling of the birds in the branches, I suddenly hear the soft laughter of the spirit lei makers, the murmur of their voices rising and falling in the breeze as they once more “talk story.” The past touches the present and the circle is complete. Ua lehulehu a manomano ka ‘ikena o ka Hawai’i – endless is the wisdom of the ancients.